Religious silliness reigns at the Calderwood Pavilion as SpeakEasy Stage Company presents Charles Busch's campy, irreverent Off-Broadway romp, "The Divine Sister." "The Divine Sister" is Busch's comically twisted, but ultimately affectionate, homage to every nun movie that ever graced a darkened cinema. If you're sharp, you'll have your fill of hit and run references ranging from "Agnes of God" and "The Sound of Music" to "Doubt," The Singing Nun," "The Song of Bernadette," "The Trouble With Angels" and more (. . . "Auntie Mame" is thrown in for good measure). All that's lacking is Sister Bertrille flying above our heads on guy wires. In "The Divine Sister," life is on the skids for the towering Mother Superior of St. Veronica's School in scenic Pittsburgh. She's got a postulant who's experiencing visions. There's a surly nun from Berlin breathing down her neck. And her school and convent are falling down around her -- brick by brick. 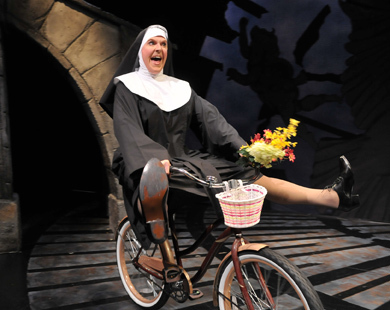 Holy cow, what's a nun to do? Why open her heart and sing a song, of course. To summarize the plot would be an exercise in futility as it's all a dizzying swirl once things get going. Suffice it to say the evening is a revolving door of naughty words, filthy words, flatulence, sight gags, a DaVinci Code mystery, nausea, long lost lovers, an albino monk, babies out of wedlock, a wealthy benefactress, and flashbacks to murder. 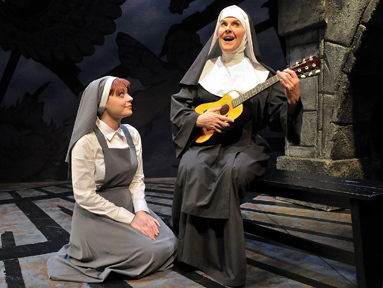 Mother Superior, who never met a key light she couldn't hog, is played with self-righteous humility by Varla Jean Merman (at left with Sasha Castroverde), the alter-ego of Jeffrey Roberson. Fussing and posing and jubilantly rousing the masses, the gender-bending Merman is perfect for the role of the feisty nun who sees a silver lining lurking within the most violent of thunderstorms. Making her entrance sailing onto the stage, legs akimbo, on a bicycle, Merman knows how to play the material for all its worth. Serious film fans will see more than a touch of Rosalind Russell within the robes of Mother Superior. Aside from Russell having starred as Reverend Mother in "The Trouble With Angels" and "Where Angels Go, Trouble Follows," she was also the iconic "Auntie Mame." And just as Mother Superior in "The Divine Sister" had a previous life as a fast-talking girl reporter, Russell starred in the film "His Girl Friday," about -- what else? -- a fast-talking girl reporter. Paula Plum is Sister Acacias, the convent's Supervisor of Novices & Wrestling Coach. She's the Mary Wickes of the group, plodding around the stage in black hightops and sputtering an accent worthy of "Jersey Shores." Sasha Castroverde is the innocent Agnes, who's afflicted with the power to see and heal. She's being stalked by Jeremy, a reporter who's looking to opt her story for the silver screen. As Jeremey, Christopher Michael Brophy mugs and poses with the best of them. Little do the nuns know of the secrets he's about to unearth. Brophy also plays the sinister Brother Venerius who practically needs a road map to explain why he's there at all. Ellen Colton is the affluent Mrs. Levinson, a money bags atheist who organizes her life memories by the designer outfits she was wearing. She also doubles as Timothy, a little league loser with misplaced longings. 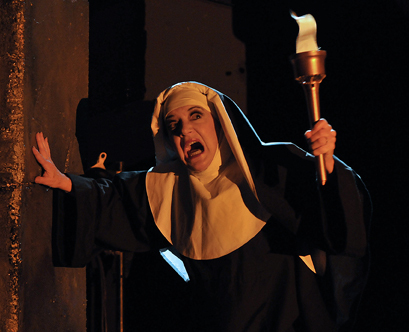 As the maniacal Sister Walburga, straight from the mother house in Berlin, Kathy St. George (at left) rips up the place as the sadistic German nun who's up to no good. She too, doubles, as Mrs. MacDuffie, a Scottish charwoman in a fright wig that looks like she's been using it to scour pots. Director Larry Coen keeps the action sharp and brisk, remaining faithful to the source genre while giving the show the zippy zing and multiple sight gags it needs to breeze along. The evening's only weakness, and a minor one at that, is that Busch has elongated a speech or two. And in this kind of convoluted machine gun comedy, you can't afford to let the audience drift off long enough to let 'em think too much about what's happening. On the production side, Cristina Todesco's set consist of a bench and two stone archways that slip and slide around the playing area. Todesco has cleverly used these three simple pieces to represent almost two dozen locations, effectively and effortlessly. In the end, "The Divine Sister" is about surviving the storm to bask in the glory of another day. That, and finding your key light. "The Divine Sister," from SpeakEasy Stage Company, at the Calderwood Pavilion through November 19. 617-933-8600.